The Joker breaks out of Arkham to collect a $20 debt, only to learn a famous author ranks the Riddler as Gotham’s cleverest criminal. Joker responds by threatening to kill Riddler by midnight, and staging a mass breakout at Arkham. This is all a diversion, though, as Joker is busy attempting to kill the author. 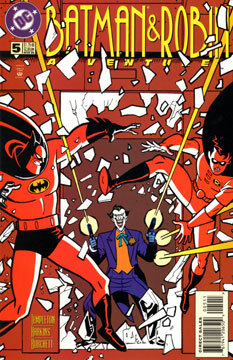 The Joker then returns to Arkham to kill Riddler after all, but is intercepted by Batman and Robin. His spree ends when he… wait for it… slips on a banana peel. Ty Templeton has some fine scripts in him. This is not one of them. The pretense that the Joker would be jealous of Riddler is a strong one, and something that could play out in interesting ways in almost any establish comic universe. Sadly, this script did not live up to the potential. The weak script might have been lifted up by strong art. That didn’t happen. I’m not familiar with the work of Tim Harkins, the penciller. I’m sure he’s fine with funny animals and Mad Magazine-style humor, but that look isn’t appropriate for a Timm-verse comic. This issue’s art was very sub-par. Not really, but since the issue is lousy overall, it almost doesn’t matter.